DDS shall supply each assigned school Multimedia Content for the e-learning project for 9 subjects, viz. English Grammar, Biology, Chemistry, Physics, Geography, History, Political Science, Environmental Science & Mathematics. These will be for standards I to X and will be mapped to CBSE / State / ICSE Boards syllabus. Each chapter is mapped according to the required state board. The Chapters are divided into sub units and each sub unit has capsules which contain learning objectives followed by visualization and explanation of the concept and finally an assessment of what has been learnt. 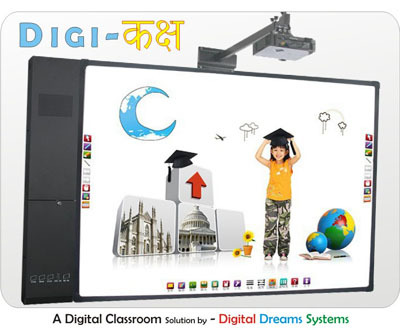 The content is available class wise and subject wise for Hindi and English Medium Schools. All teachers must Preview all the capsules of their subject irrespective of the Class. Previewing will help to combine different capsules during the teaching – learning process. Incorporate points of Integration regarding the visuals which are beyond the board / lab. A Lesson Plan may contain capsules from different classes and different subjects. Include 2 innovative questions based on the capsules taught in the class. Teachers’ voice – All user teacher should retain their style of narration and pace of teaching. Textbook – The teachers must co-relate the contents of the textbook with the contents of the capsule. Board – The board can be used as and when required by the teacher.